This is yet another of those movies that I watched at my grandmother’s house, and I had few fuzzy memories as time wore on, clearly remembering only that I was frightened to go in the woods—especially the five acres of it that embraced our isolated cabin in the Adirondack State Park. The Evictors was decent, but not as haunting as The Legend of Boggy Creek. Because it’s become a cult favorite (and it’s a Halloween season staple for me), there has been a lot written about it, and all of it’s valid, but I’ll share my thoughts. The scariest moments in this film are built around people in their isolated homes or trailers thinking they hear something moving around outside, and yet they never quite get a full-on view of their attacker. These incidents play out between equally chilling first-hand accounts of a dead kitten “unmarked; apparently, she had simply been scared to death,” gargantuan footprints and mutilated livestock. 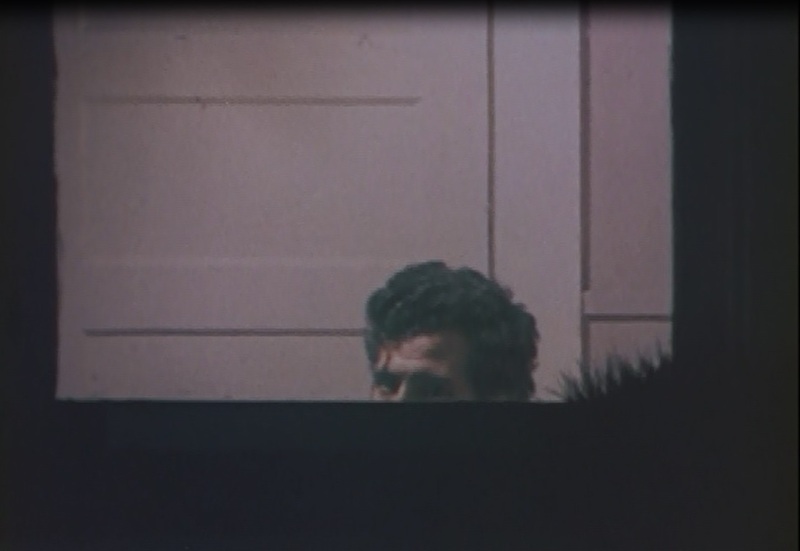 Pierce does a lot with people looking out of windows in this film. While that may be true to life, the presence of so many windows suggests a comment on an encounter with the unknown; a realization that we are not alone in the world. Again, Pierce and the windows. Here, there is only a flimsy trailer between these teens and the beast. 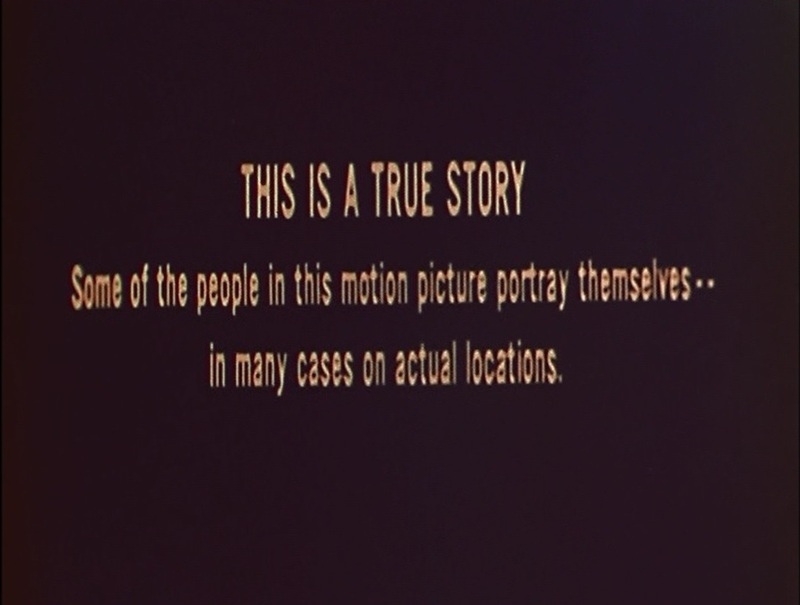 This is one of those scenes in which the film excels: it’s what we don’t see, but what we HEAR that makes it scary. While the shots of the monster are, clearly, shots of a man in a suit, it’s the way they’re presented that makes them creepy and not cheesy. 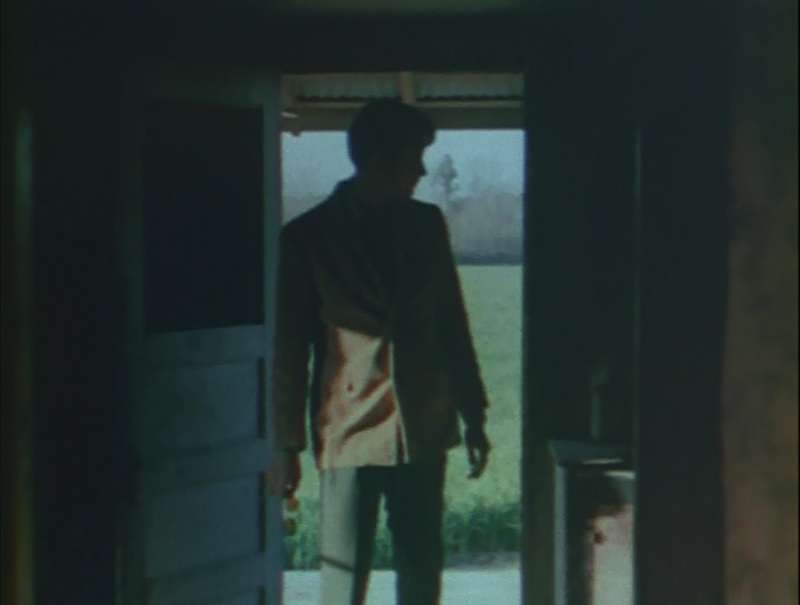 They’re reminiscent of the Patterson film aesthetic; we see a black shape, walking, hulking, but never really in focus, and shadowy and blending into the trees. It’s quite effective, as it allows room for the imagination. (If you’d like to see the Patterson film – and get the significantly less magical treat of what it looks like when it’s stabilized – you can do that here: http://www.relativelyinteresting.com/heres-what-the-bigfoot-patterson-gimlin-film-looks-like-when-its-stabilized/). Here’s one of those wonderful moments in the film in which we can see the creature, but he’s obscured and much is left to the imagination. “Next morning they would discover their dead kitten” – Unmarked; apparently, she had simply been scared to death.” What’s really interesting about this is that the quality of the film is so bad that this image–especially when seen on a tiny television–is so dark that I never actually saw it until I got the DVD. Here’s another fine example of how fog and forest were used to make a guy in a Bigfoot suit seem more menacing. Mr. Crabtree lived in the Bottoms–the creature’s domain. It amazed me that the creature didn’t scare him. It always confused me why three kids would see the creature and be terrified — then want to get their mom and go back? Seriously? This scene, in which three teenagers struggle to load a shotgun to protect themselves, was nervewracking because I was convinced they were going to shoot themselves. But it’s really the final vignette of the film—the assault on the Fords and the Turners—that leaves the strongest impression. Like the episodes that come before it, the family is trapped in the home, hearing mysterious noises or seeing strange shapes out in the woods. But this time, the creature attacks, sticking his arm through a window on the porch and knocking one of the men off the toilet—quite comical to watch now, but as a kid, the idea that you could be swiped off the john by Bigfoot’s huge paw coming through the window was terrifying. Every dude’s worst nightmare — a hairy arm coming at you while you’re trying to take a dump. Posted on September 19, 2017, in Horror Movies, Tot Terrors and tagged 1970s documentary about Bigfoot, Charles B. 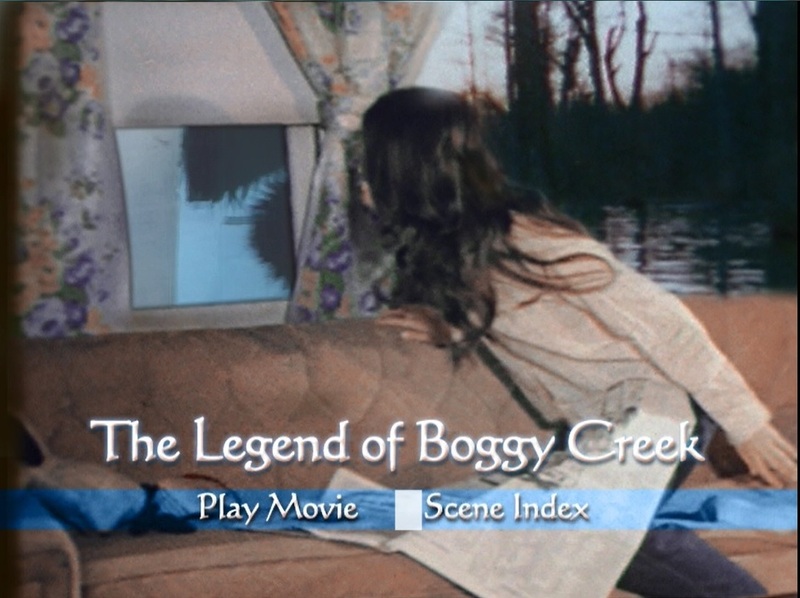 Pierce, Fouke monster, Texarcana legends, The Evictors, The Legend of Boggy Creek, The Town that Dreaded Sundown. Bookmark the permalink. Leave a comment.